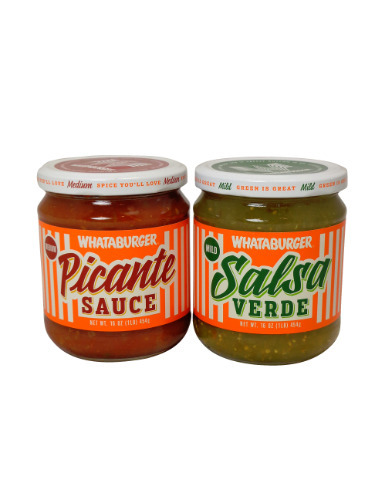 FRESH 16oz glass bottles of the Texas legendary Whataburger Picante Sauce and Salsa Verde pack!! Perfect gift for any mis-placed Texans or for a friend! Perfect for pairing with eggs and bacon in the morning hours or tacos at lunch, Whataburger’s Picante Sauce is great for dipping, dabbing or topping just about anything that needs a little spice with this one-of-a-kind sauce. Whataburger’s Salsa Verde provides great flavor that’s perfectly mild when it comes to spice. This light green salsa is made from a blend of onions, jalapeños and tomatillos that will make your breakfast, lunch or dinner more flavorful.